So while I was going to get a coffee to see if I could put some pep in my step, I said, "Hey, it's the Hebron Fair weekend!" So I drove a half hour to Hebron, figuring I'd drop about $20 for a couple hours entertainment ($5 parking, $12 gate). 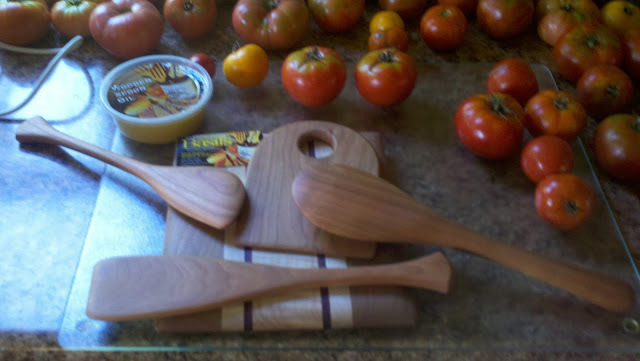 Unfortunately, I found the.greatest.kitchen.utensils.ever...at least this side of Wusthof knives -- and unlike Wusthof, something I could (sort of) afford to indulge in -- Chester P. Basil wooden spoons! Which of course, got me fascinated with how they're made...which after some Youtube videos made me drive (by way of Baldwin Brook Farm since I was desperate need of milk!) out to Woodcraft of Manchester for a book on woodturning and a catalog. And since I was there over to Cabela's down the street to engage in yet another manly activity, drooling over guns. Back to Brooklyn to put the milk in the fridge, then up to Southbridge to meet my friends Eric, Sam, Andre, and met for the first time Alex -- had a great lobster and something else pizzerita(!) at Fins and Tales and over to a total cheap place of a club to see John Valby. So overall, it ended up being a pretty interesting day!